Welcome back to the city on the seven hills! Rome was one of the most powerful and beautiful capitals of all time. 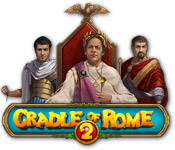 Write your own history of the Roman Empire in the engaging Match 3 game, Cradle of Rome 2. Journey through incredible matching fun and the exhilarating process of building the city. Experience the new world of Rome from the cradle to the glory! Solve challenging minigames and draw blueprints to turn your small settlement into the flourishing empire. Cradle of Rome 2 is rated 4.2 out of 5 by 20. Rated 5 out of 5 by millooneyum from A timed/timeless classic. One of my favorite Match-3 games. Ever. This game focuses more on the match-3 experience than story line. But that's okay. You build the empire of Rome, with every level you complete. There are also achievements to try and earn. All-in-all, a great game and good fun. Rated 5 out of 5 by pennmom36 from Cradle of Rome 2 I have played a lot of Match 3 games and none of them can hold a Roman Candle to the Cradle of Rome series. Although the original Cradle of Rome is more challenging, the added features and graphics improvements make this an outstanding contender. The goal is to turn all blue tiles yellow and overcome obstacles such as double marble tiles, chains, double chains, ice blocks and those dreaded skulls that when matched add blue tiles to the board. With the resources and gold you earn you will buy buildings to build the city of Rome and each building comes with bonuses. There is a hammer to remove a single tile of choice, bomb to remove 9 tiles, fireball to remove a column and row, hourglass to add time, lightning to destroy 15 random tiles, super bomb to destroy 25 tiles, mixer to shuffle all tiles and star which removes all similar tiles. If you make a match 5 or more you get a super arrow on the board to destroy tiles in that area. You will earn a new life for every 50,000 points and there are 16 citizens to earn by making a certain amount of resource matches or making 2 match 5's in a row for example. 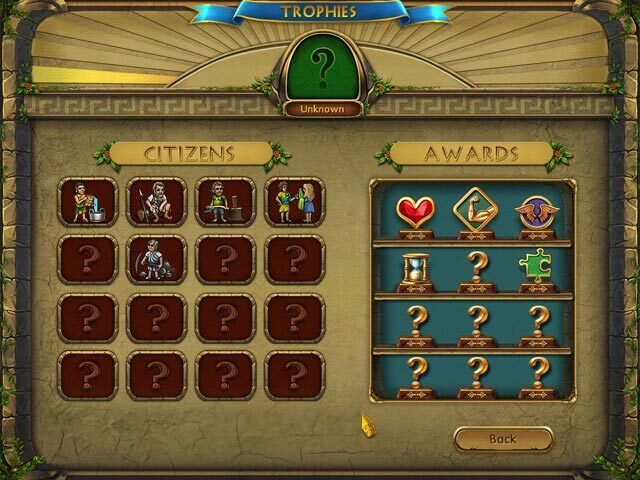 There are 12 trophies to earn for different goals such as earning all citizens or playing all mini games. There is a Tourney mode available at 500,000 points which allows you to play 40 selected levels to earn gold, silver or bronze medals when you beat the best scores from the devs and you get to choose any one bonus to help you. The Blitz mode is my absolute favorite available in Easy, Normal or Hard modes (or all 3) and you earn Gold, Silver, or Bronze medals. In the Blitz mode you start at level one and continuously play uninterrupted until the timer empties. You keep progressing through the levels, the timer will stay full if you are making matches rapidly but drains if you are hesitating. if you use your bonuses (same bonuses, same levels as earned in main game) the timer fills but you have to match more bonus tiles to refill, super arrows also fill meter up. This is an extremely fast paced game but quite thrilling, enjoy! Rated 5 out of 5 by ret65 from Fast moving fun game. This is much better than the first Cradle. The curser was terrible in that first game. You lost time. This game is just great. Great graphics, great curser, just love it. Read the reviews of others and that helped me make up my mind. Keep up the good work with this style. Thanks a bunch. Keeps the brains cells moving. So glad I tried it. You won't be sorry buying this great game. Just hard enough to keep your interest but not STOP you. 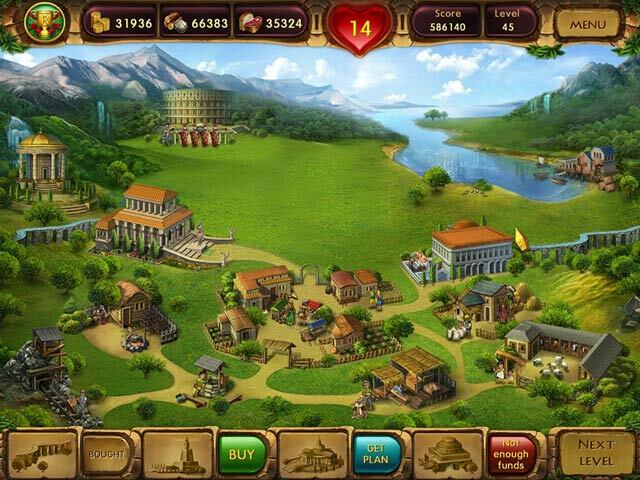 Rated 5 out of 5 by custer4me from Cradle Of Rome 2 Quick thinking challenge game! Rated 5 out of 5 by MEnr56 from USE POWER-UPs and BUY RESOURCES This is the 1st timed-management game that I've ever been able to actually COMPLETE to the end (100 levels) due to the fact that I used my power-ups (when available so they could refill) specifically on hard-to-get-at areas of the board. Also whenever the timer ran out and I was asked if I wanted to buy resources, I ALWAYS said yes (particularly on the last level) and I never ran out of resources and was always able to complete each level without losing a life. Also try to quickly ascertain if you've got a win-able board (meaning without having to use power-ups too often) and if not, go for the icons that refills those power-ups only and use them as quickly as possible once refilled -- that was the ONLY way I was able to win Levels 99 and 100 (as well as buying the resources) WITHOUT losing a life and having to repeat them; there was 1 or 2 levels earlier that I also did that way. Rated 5 out of 5 by SynthpopAddict from Great followup to the original Pros: multiple game modes, minigames, good learning curve Cons: timed only, monotonous soundtrack, highly difficult near end of game Cradle of Rome 2 features the same gameplay as its predecessor in that you are once again building up ancient Rome by collecting various resource tiles from the game boards in order to construct the city's buildings. Many of the powerups found in the original COR are back along with a couple of new, improved ones to make clearing out tough spots a little easier. The tricks for getting citizens to move into your city are no longer secret and can be found in a number of ways. Another new addition is the minigame to play to get a building blueprint (a blueprint must be obtained before you can buy a new building). These minigames include jigsaw puzzles, rotate the wheels, find a pair, and flip the card memory games. Although they aren't all that hard, they are a nice break from constant M3 action. In addition to the adventure mode, there are two new game modes to unlock as you progress through adventure mode, Tourney and Blitz. In Tourney you'll be competing against who I presume were the game developers or testers for trophies on a board of your choosing. I have yet to decipher all the tricks for winning the Tourney trophies but it is definitely not just finishing first. 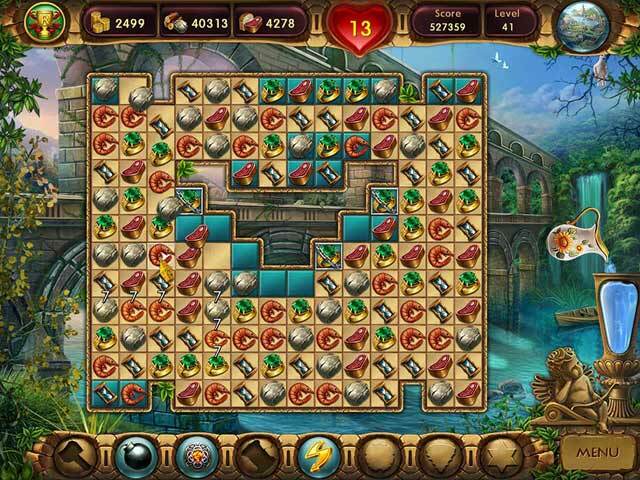 In Blitz mode you try to go as far through the entire game as possible with each board on a special fast moving timer. There are three different difficulty levels to choose from and Hard made me look foolish after level 20 so adrenaline junkies are sure to get their fix. The learning curve for adventure mode is back and still as good as the original. A nice update is that the double chained pieces don't appear until much later in the game, but that doesn't mean there aren't still challenges aplenty. The new obstacle to hate has got to be the skulls, but those won't appear until after the halfway point. The ice blocks can also prove tricky until you figure out the patterns to make around them. Sadly, COR2 still doesn't feature an untimed option, so once again, finishing the game is better off left to the pros. The game window if playing in windowed mode is larger than in COR and the game tiles are likewise larger to make finding matches a little easier. The graphics have received a refreshing update and the citizens are no longer as cartoonish looking. The soundtrack, although improved from the original's in quality, lacks variety and gets very boring if playing for a long time, so if you can't tune it out, you may want to turn it off in the game options. Look for the circular saw at the sawmill; it's another feature they brought back from the first game, and the current upgrades to it always make me laugh! Rated 5 out of 5 by slubey from im hooked on this game great game would like to know if there is going to be a number 3 cradle of rome in the near future? Rated 4 out of 5 by Boomer1097 from Fun Match 3 Game I enjoyed this game. The graphics are nicely done, the match 3 games are challenging and you get to build things. The music was annoying, so I muted it. I liked this game much better then the first Cradle of Rome.